Don’t be fooled by its size — this diminutive 100W amp packs a serious punch. Regular visitors to music trade shows will know what a dazzling, tasteful guitarist Thomas Blug is (he’s often engaged to put on product demos), but he’s also a talented electronics engineer who has spent over two decades designing amps for Hughes & Kettner. Thomas recently set up his own company, BluGuitar, and his first product is the aptly named Amp 1. An extremely compact 100W amplifier head, the Amp 1 was designed in collaboration with a Russian engineer to meet Thomas’s touring needs, so it’s small enough to put on his pedalboard when flying around the world. All he needs at his destination is a suitable speaker cab. The amp’s launch met with a very positive response from guitarists, so I met up with Thomas at the 2015 Winter NAMM show, where he gave me a personal tour of his amp, before sending me one to test more thoroughly in my studio. Thomas plays a modified Strat on which the usual single-coil pickups are augmented by a hidden hum-cancelling coil in the body cavity. You might expect him to have voiced the Amp 1 to work best with single-coil guitars such as Strats or Telecasters, but while it certainly works with them, he’s also given it enough tonal and gain range that it works equally well with humbucker-equipped instruments. Right from the off, you can see that this amp head differs from what you might normally expect of a 100W head, as it includes stompbox style integral foot switches. Its aluminium-clad case (245 x 192 x 68 mm) is little bigger than a hardback novel, and it comes in its own zip-up protective bag. 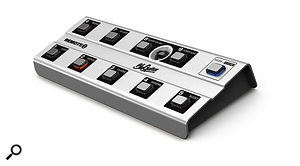 It can also be used ‘off the floor’, by adding optional control switches for channel and internal-boost selection. The amp’s underside is shaped to slot over a cabinet or amp strap-handle and, for those averse to using Velcro, there’s an optional ‘EasyLock’ magnetic pedalboard fixing system. How Thomas managed to get everything into such a compact case is best explained by looking at the individual circuit elements. The solid-state analogue front end runs into a power stage, the front of which is designed around a miniature military-style, Russian dual-triode valve and dummy load, to create the ’tube’ character. This very long-life valve ‘Nanotube’ is soldered to the circuit board, so there are no sockets to cause problems. After this comes a Class-D output stage that does the heavy lifting. The circuit design is a little bit special — it’s designed to replicate the current feedback and power-supply-sag characteristics of a traditional valve output stage, so that it reacts correctly to the loudspeaker load and power level. The main controls are very familiar, with Volume for the Clean channel and both Volume and Gain for the overdrive channel. A rotary switch selects the channel voicing, and there are three options in addition to Clean: Vintage, Classic and Modern. The tone controls comprise Bass, Middle and Treble, with no ‘presence’ knob, though they apparently change character depending on which overdrive channel is selected. Unlike most amp tone-stacks, they’re designed not to interact, and if all three are turned right down there’s no output. There’s also a built-in digital reverb that emulates a spring reverb, plus a master volume control. A small, quiet fan cools the power section and vents via the rear panel, where power (universal voltage) comes in on a standard IEC cable. In fact, the only trick that seems to have been missed is that there’s no 9V output for powering any Boss-compatible pedals that might be sharing the board. All other connections are via rear-panel jack sockets: the input, the two (8 and 16 Ω) speaker outputs, the effects loop in and out, the footswitch/MIDI port and the ‘Rec’ recording line out, with a speaker emulator. Usefully, as well as acting as an output for direct recording, the Rec output can also drive headphones. When no speaker is connected, it expects to ‘see’ headphones, whereas if a speaker is connected, the output operates as a balanced line feed, which is very clever. Note that you can’t connect the record output directly to a mic input that has phantom power applied — a DI box would be the preferred option in this case — though the manual does show you how to make up a simple passive circuit that matches the signal level to a mic input and isolates phantom power. There are also some great tips on getting the right tone from the amp. Direct foot control is via three footswitches with illuminated surrounds: the left-most switch alternates between Clean and the selected overdrive channel; in the middle is a boost switch that applies to both the Clean and overdrive channels; and the reverb-bypass switch is on the right. However, a second mode, called up via a ‘power up and hold down buttons’ routine, enables the three footswitches to select between three presets set up by the user, and these are remembered when the amp is turned off. The brightly lit BluGuitar logo, which dominates the front panel, is bright enough that it makes it hard to see the other controls when working in dimly lit environments. Despite the simplicity of the top-panel control layout, the user has access to a number of tonal tweak options on the side of the amp, which is designed so that it can sit happily over a typical combo’s or speaker cab’s carry strap. While the panel controls appear simple for an all-singing, all-dancing amp, there are more controls tucked away on the left-hand edge of the case — six trim pots can be adjusted (with small fingers or a screwdriver) to tweak the tonal colour and boost settings. The Boost control adjusts the tonality when the Boost footswitch is engaged, while Modern and Classic have both Volume and Tone settings. The Clean channel has only a Tone setting. 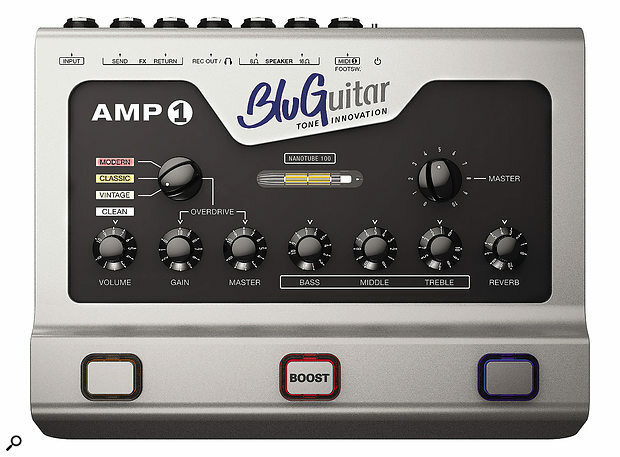 The ‘Vintage’ amp tonality is not adjustable other than by the main tone controls, although it’s affected by the setting you apply to the Boost mode when active. Thomas explained to me that the preamplifier section contains two differently voiced tone stacks, and that these tweak pots essentially balance how much signal goes through each. There’s also a switchable (hard, soft or off) noise gate that can be useful in cleaning up high-gain sounds, though when the Vintage or Clean mode is selected the gate automatically reverts to the soft setting, if active. In soft mode, this is unobtrusive in action. I’d expected the gate to come before the reverb (to avoid affecting the reverb tails) but Thomas placed it post-reverb to provide a greater degree of noise reduction (something he says is important when playing with orchestras), and with soft mode engaged I must admit I didn’t notice the reverb tails being shortened. Hard mode is much more assertive, but useful for full-on, high-gain metal styles. Another thoughtful feature is that the effects loop can be switched for series or parallel operation, and if you use the amp on a pedalboard, ‘loop’ effects can be left permanently connected. A recessed button beneath the amp sets the effects-loop operating range to suit pedal or line-level effects, but there’s no effects level control, so if you use parallel mode you’ll have to adjust the added effect level on the effects unit itself. The Amp 1 sports an impressive array of inputs and outputs for such a small device.The TRS footswitch jack can take a standard dual footswitch for clean/overdrive and boost-switching, the (optional) BluGuitar MIDI 1 adaptor or a BluGuitar Remote 1 floor controller. 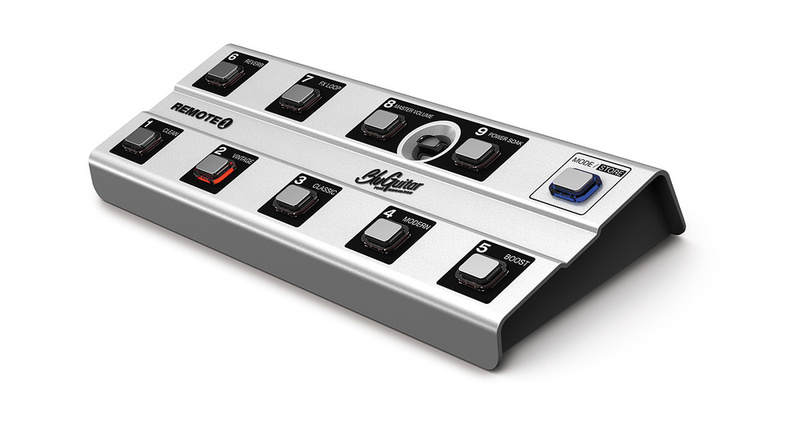 In addition to providing comprehensive remote switching, Remote 1 also increases the memory capacity of the amp to 36 patches, arranged as nine banks of four, plus a power-soak function controlled by a second volume control. Another optional extra that fits onto a Remote 1 is the Looperkit, which provides four sets of relay switchable effects loop in/out options, which are saved as part of your preset. I only had a standard footswitch available (this worked fine) but it’s good to know that more advanced means of control are available. If the MIDI 1 adaptor is fitted, any MIDI floor controller can be used, and the Amp 1’s Learn mode should make assigning functions relatively painless. Right away, this amp delivers the punch and authority you’d expect from a large valve head. Obviously, the general tonality is affected by your choice of speaker cabinet; my tests were done in the studio with a 1x12 Celestion-loaded cabinet, but the Amp 1 is quite capable of driving a 4x12 cabinet hard. When dialling in your sound, you have to bear in mind that small adjustments of the controls, especially the tone controls, can make a lot of difference, so you must be prepared to put in the time to find the sweet spot that works with your chosen guitar and speaker cabinet. Importantly, the Amp 1 sounds good at lower volumes, even without the power-soak option, though pushing it harder does bring in more power-stage saturation, just as with a traditional valve amp. The character of each amp type (other than Vintage, which is fixed) depends on how those preset tone tweakers are adjusted. The Clean channel can range from open and airy to a Fender-like character and, where higher volume settings bring in a little warmth and compression, can add a suitable amount of ‘spring’ to the playing feel. Depending on your pickups, engaging the boost function adds just enough ‘hair’ to nudge the Clean channel into blues and ‘light drive’ classic-rock territory. The Boost tweak control adjusts the tonality (common to all channels) from warm to bright. The optional floor controller not only gives you access to more settings, but also augments the functionality.While the Vintage mode doesn’t have tweak pots, it’s fine-tuned for Thomas’ own use, evoking the British pre-metal rock sound, rooted in the 1960s and ‘70s. Having said that, this channel also seems capable of surprisingly Vox-like tones. The Vintage channel works extremely well with the drive dialled back and with the guitar volume backed off, giving a nice country ‘snap’ to the sound. Turn up the guitar and you get a bluesy warmth. This setting also works well with a good overdrive pedal (I tried my Fulltone OCD and an EHX Soul Food), so without changing amp settings or channels you can go from almost clean, via a trifle unwashed to classic rock. Both Classic and Modern voicings can be tweaked, with Classic covering ground already trodden by certain later-generation valve amps of a Bletchley/Milton Keynes provenance. Again, this channel is tonally versatile, with enough adjustment to go from almost clean to heavy rock. Modern, on the other hand, has something of a transatlantic flavour, with more gain on tap than the previous channels and enough range to take on a ‘metal’ edge, though it can also deliver some very warm and creamy Gary Moore-style sustain, depending on how you set the tone controls and tweak pots. Importantly, all the dirty sounds clean up nicely when you back off your guitar’s volume control. Although a digital emulation, the reverb sounds suitably spring-like. It may lack the organic warmth of a real high-end spring unit, but it gets pretty close — and it doesn’t twang if you knock the amp, which is nice! We’ve seen pedal-style amps before, some of which are impressively powerful, but none I’ve tried comes close to being as comprehensive as the Amp 1. It really does cover pretty much all the tonal and stylistic bases, and does so with a lot of tonal maturity. Equally important is that it feels as though you’re playing through a ‘proper’ amp. The speaker-emulated output also gets very close to the sound of the amp as heard in the room, and the background noise is commendably low, making this amp ideal for recording applications, whether miking or DI’ing. You can also take the loop send to another guitar amp to use the Amp 1 as a kind of luxury overdrive device or, conversely, feed another of your guitar preamp devices into the loop return and use just the power-amp section. While not exactly a budget purchase, the Amp 1 holds its own in terms of sound and volume against many all-valve products, some of which are significantly more expensive. Although such amps may look more impressive, there’s a lot to be said for the portability, convenience and sheer tonal versatility of the Amp 1. When I consider that the Amp 1 can also be expanded to become a fully programmable amp rig by adding the Remote 1 floor controller, I find myself asking what there is not to like. I’m really looking forward to seeing what Thomas Blug comes up with to follow this most impressive debut. There are several other compact high-power guitar amps that would fit on a pedalboard, and there also are plenty of DI-plus-amp-simulator pedals for recording. There are also other means of taking a recording feed post-power-amp stage. But I’m not aware of any other product that offers all this in a single compact box, particularly given the Amp 1’s expansion options! Extremely compact yet massively powerful. Designed to fit on your pedalboard. Wide range of authentic guitar-amp tones. Useful range of optional expansion devices. Ideal for studio or live use. No adjustable effects-loop gain for setting the effect level in parallel mode. The compact size could lead some potential purchasers to suspect that the BluGuitar Amp 1 is overpriced — which really isn’t the case. It’s a genuine alternative to a large amp head that caters for all musical styles without operational complexity.